Having paused for over two years, I’m back thinking about my old obsession: how to map travelling time. I have repeated the map I made for driving times in the UK, but this time starting at the Cherry Creek Shopping Centre in Denver, Colorado. High resolution image available here. 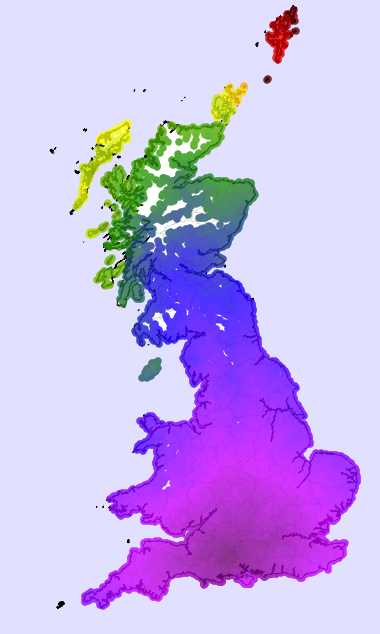 Suggestions for how to create isochrones gratefully received! 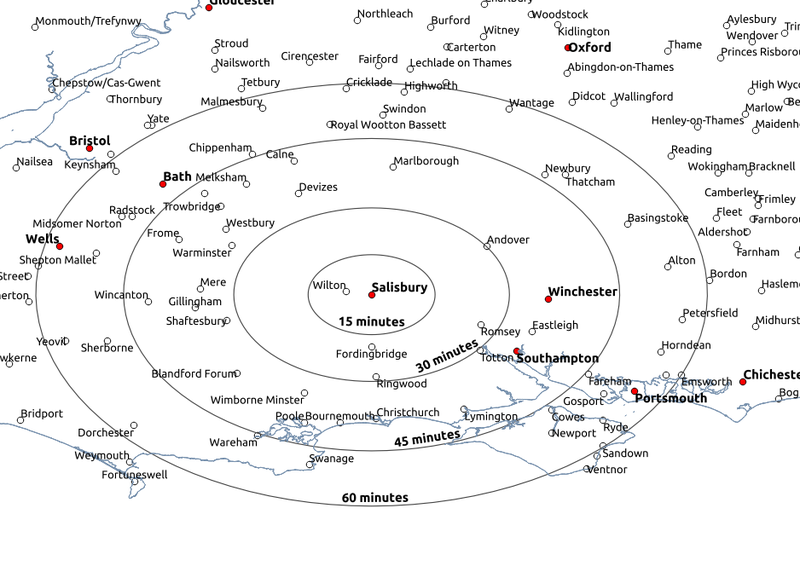 Driving times from Salisbury to the settlements of Great Britain. Red locations take the longest to drive to, purple the least. Both maps have a linear colour scale; it takes a long time to drive to Sheltand! Contains Ordnance Survey data © Crown copyright and database right . Travel times powered by Google. Each day Google tell me another 2,500 driving times, letting my map grow – the villages, towns and cities of the UK start appearing like bacteria growing on the agar jelly of southern England. In other news I have re-projected from WGS84 to UTM zone 31N, which makes the UK less squashed. I’ve also coloured the sea and found some motorways and county boundaries. 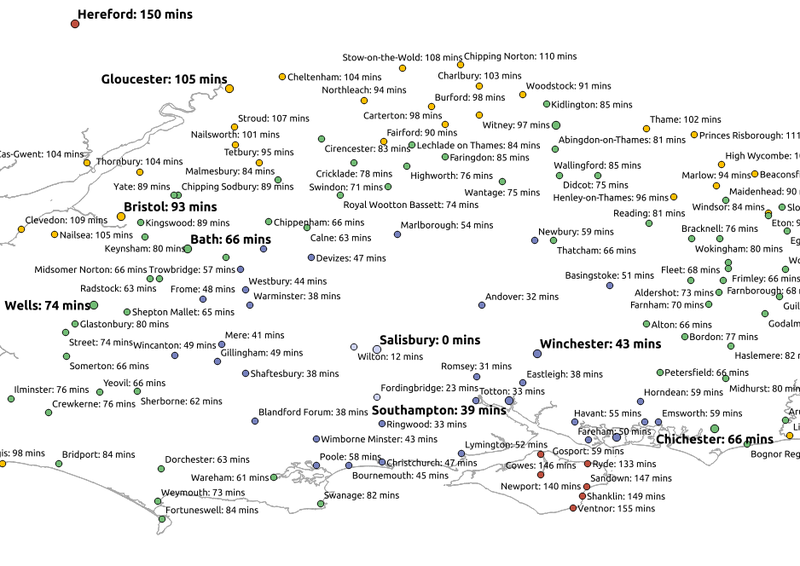 A map of travelling times (by driving) from Salisbury, as part of my redesign of the TFL maps. The travel time (after the town name) is the Google Directions journey time, not corrected for current traffic. My first attempt at solving the misleading TFL maps problem is to replicate the maps, centred on Salisbury. The contour lines are based on arbitrary Google Maps routes. Locations and UK high water line provided by Ordnance Survey. I think this map is fairly clear, and the timings aren’t too far from my expectations. 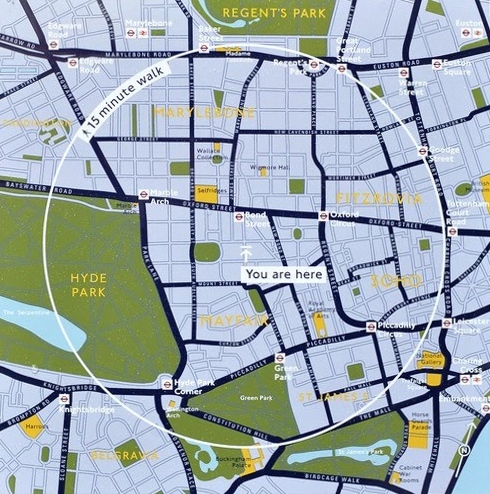 This map takes a somewhat simplistic (and in the case of the serpentine, optimistic) view of how far you can walk in fifteen minutes. I plan to try and improve upon this.